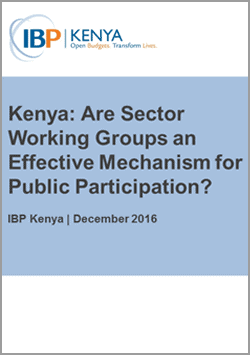 Kenya: Are Sector Working Groups an Effective Mechanism for Public Participation? The logic of Kenya’s budget process is to begin by distributing the budget at the sector level and then move to finalize allocations at the ministry, program, and sub-program levels. The process begins with a proposed sector distribution in the Budget Review and Outlook Paper (BROP) which is later finalized in the Budget Policy Statement (BPS). Between the BROP and the BPS, the process of reviewing and adjusting sector proposals is carried out by Sector Working Groups that are meant to facilitate government coordination around the budget and to be the main mechanism for engagement with the public on sector priorities. But are Sector Working Groups an effective means for the public to influence sector budget allocations? This brief assesses Kenya’s 2017 BPS to see whether the public’s priorities have had an impact on sector allocations and what reasons the government provided for including or excluding them. The authors conclude that there is scant information provided in the BPS on the impact of public views in sector allocations and that it is not possible to tell whether public views were taken into account in most cases, though in some cases it seems clear that they were not. Where public views were not included, the explanations for excluding them are inadequate.